Food is a great part of our lives. We confront it three times a day. So we are always in a quest to make these times enjoyable and memorable with tasty and delicious dishes. One of these fine dishes is Spaghetti. 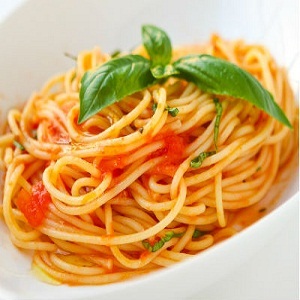 Spaghetti originated from Italy but is now a worldwide popular dish, eaten with great relish. The noodles are coupled with different sauces, meat and vegetable to make a fine treat to the buds. However, it is traditionally and mostly eaten with a combination of tomato sauce. The tangy taste of the sauce combined with the filling noodles makes it a lethal duo on the dining table. It is also very easy and does not take much time. So you can conjure up the dish when the clock is ticking its last minutes to meal time. Take the large pot and fill it with water to a level where it is enough to cover the pasta well. Add salt and a splash of live oil and start heating the water. Bring to boil and add the pasta. Stir the pasta slowly to dis-tangle and boil for around eight minutes. Do a softness check with a strand of pasta. It should be soft to eat but yet firm to the teeth. Remove the pasta from the heat. Place a strainer in a sink. Pour over the pasta mixture into this strainer and now rinse with cold water under the sink. The cold water will prevent the pasta from sticking together. Shake well to get the excess water out. Your pasta is ready. Crush the garlic and mince the cloves. Now heat some olive oil in a pan and saute the garlic till they start changing color. Add to it the crushed tomatoes and stir well. Add the spices and mix in. Season with salt and freshly ground pepper according to taste. Cover the pan and let the tomatoes simmer for twenty minutes so that a well cooked sauce is made. Scoop out the noodles in a presentation platter. Now pour in the pasta on one side of the platter or over the noodles. Garnish with mint leaves and grated Parmesan cheese.